Often referred to as “Mrs. Lawrence Lewis” in suffrage literature, Dora Lewis was from an influential Philadelphia family. She was part of the earliest core of activists who worked with Alice Paul, Lucy Burns, and others in the 1913-15 period of internal conflict–between the members of Congressional Union of Woman Suffrage (CU) who favored more innovative methods over the more staid leaders of NAWSA. Lewis was a member of the initial executive committee of the NAWSA Congressional Committee in 1913; she remained a central figure throughout the NWP’s major public demonstration campaigns. Lewis was among the outspoken hunger-striking suffragist prisoners and she received some of the most brutal treatment at the hands of wardens at the District jail and the Occoquan Workhouse. During the infamous “Night of Terror” of November 15, 1917, at Occoquan, Lewis was hurled bodily into her cell. She was knocked unconscious and feared dead when she collided headfirst against her iron bed frame. Lewis and Lucy Burns were initial leaders of the hunger strike in Occoquan; both grew so weak that they were held down by attendants and force-fed through a tube. Lewis was the primary speaker at a protest held in memory of Inez Milholland at Lafayette Square in Washington, D.C., on August 6, 1918. When she was dragged away and arrested before finishing her first sentences–much to the consternation of the gathered crowd–other speakers rose to take her place. One after another, they too were arrested. Lewis began the NWP’s watch fire protest when she set to flames copies of Woodrow Wilson’s speeches in a demonstration New Year’s Day, 1919. She was arrested for her part in the actions. 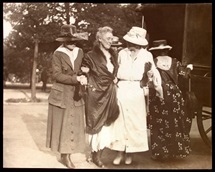 In the summer of 1919, Lewis was among NWP organizers who worked in Georgia to try (unsuccessfully) to secure that state’s support in the ratification process for the 19th Amendment. When Georgia repudiated ratification, she moved on to Kentucky, which ratified the amendment in January 1920. Lewis also served as treasurer and as member of the executive committee of the NWP.